Awesome tutorial, it helped a lot. I'm only having one problem. Every time I click on my block the GUI gets cut off. I've tried sizing it down in photoshop, but the only thing it does it make it a blurrier cut off GUI. Gonna need to see the code for the GUI class. Also I just took the original 3x3 and edited it in Photoshop, basically I squeezed it all in, I am sure there is a better way to resize with code. Will help adjust the size limitations and help make you GUI show up better. Alternatively, you can go to this link here and see my mods made with these tutorials. They are all furnace and crafting table variations, get the better table, it is my 5x5, and you can see how I made the GUI with out changing the lines I showed you. Also you will need to adjust the slots in the container class to move left or right to line up with the boxes in the GUI. A bit tricky, but easy once you do it once or twice. Thanks I got it to work. I don't know why, but when i right-click on my table the game crash! First, please let me explain this again for those that have not paid any attention. If you are going to just copy and paste my code without trying to understand what it is that is happening in the code, I will not help you. Every class there you showed me is an exact copy of my tutorial/source code. If you are not going to make an effort to understand, or at the very least change the names of things, it shows me you just want the code and then blame me when it does not work. In other words.....PLEASE TRY AGAIN! Dude i haven't "Copy paste" I've copy your code, yes. But I write it letters by letters and i understand the code. I just don't understand why it gives me this error. And by the way, I'm trying to solve this since 6 days. OpenGL: ATI Radeon HD 5450 GL version 4.2.12217 Compatibility Profile Context 12.104.0.0, ATI Technologies Inc.
From the looks of the crash report, you botched the container class somewhere....as indicated by the crash log. Some how, you and the other guy having the same issue missed some part of the code. Since I didnt see the container posted I can only assume you dont have it, or it is missing 1 or more methods. * Callback for when the crafting matrix is changed. * Called when the container is closed. * Called when a player shift-clicks on a slot. You must override this or you will crash when someone does that. Please dont take this wrong, but based on what I see, those are two very different crash reports....this tells me that you have more than one issue going on. Also from the looks of your class files you did something very wrong. This is a suggestion, take it how you want. Make the mod class, your own, not mine, and use my example or follow a tutorial that explains it well, please dont just copy it over. I see you have my config set up in the mod class, however you used a block ID of 700. So you either dont know what you are doing, or have no idea how to use the config. Name things the way you want them, dont use my class names, block names, or item names, this is a tutorial, not a remake my mod. This is code I am providing for learning purposes, as this is my code from my mod that I actually have posted for download, not to be ripped off. I even posted my source so you could drop it in eclipse and see the code in color, real good with out having to squint at the screen and try to read. Tertio: This isn't a tutorial, its a providing code post, that's all. A real tutorial explains step by step how to do the class and all that. And the author doesn't rage each time someone needs help. "public class GuiBetterTable extends GuiBetterTable"
What?...and why is the text so small...I have a 32 inch monitor and browser set to 300% and still need my glasses to read that. 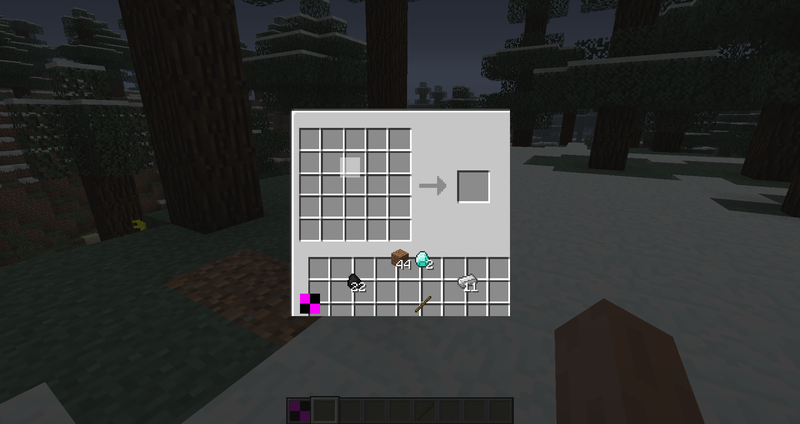 In the 3x3 crafting table tutorial you have GuiBetterTable extending itself, when it should extend GuiContainer. Also, when i open the custom table the gui flashes open for a second then closes. Okay...I will fix that...I have been busy updating a mod of mine to some new code and is taking some time to do...lots to fix. As for the issue at hand...in the container...the can interact with method, look for block.workbench.blockID, or thats what it should be, you want to change that to your block.